The particularly large platform of the seca 656 makes it possible to weigh patients not only in wheelchairs but also on all common roll-in systems or stretchers with integrated and separate under carriages. Thanks to its extremely robust construction and very high capacity of 800 lbs it is possible to weigh even heavy weight patients with little effort. The especially large platform of the seca 656 makes it possible to weigh patients on all commonly used stretchers. Patients can also be weighed while sitting in wheelchairs or on chairs. A unique characteristic of the seca 656 is the new memory function. This practical feature helps to lighten the workload especially in the emergency unit: first the total weight of the patient and stretcher or wheelchair is determined. The stretcher or wheelchair is then weighed separately and the net weight of the patient appears automatically on the display. A cable remote display with easy-to-read LCD figures is included in delivery. This display is operated intuitively and is equipped with many additional functions. With the pre-TARE function, the extra weight of a stretcher or wheelchair can be deducted directly from the total weight during the weighing process. With the BMI function, the nutritional condition of the patient can be determined. With the practical castors and integrated handles, the seca 656 is also transportable for use in various locations. The particularly large platform of the seca 656 makes it possible to weigh patients not only in wheelchairs but also on all common roll-in systems or stretchers with integrated and separate under carriages. Thanks to its extremely robust construction and very high capacity of 800 lbs / 360 kg, it is possible to weigh even heavyweight patients with little effort. With the practical transport castors and the integrated handle, the scale can be moved around easily and can thus be used in different locations. The cable remote display, which can be wall mounted or placed on a table, can be operated intuitively and is equipped with many intelligent functions: for example, thanks to the HOLD function, the patient can first be attended to before making a note of the result. The pre-TARE function ensures the reliable ascertainment of the net weight by simply deducting the weight of the stretcher or wheelchair. The extra large platform scale for gurneys or stretchers has a 31.5' x 45.6" weighing platform and a 800 pound max weight capacity. The 656 features a large weighing platform which, not only makes a great gurney scale, but a bariatric scale. The seca 656 is well-suited for hospitals and clinics, particularly anesthesiology, geriatrics, gynaecology, intensive care, nephrology, nursing homes and retirement homes. 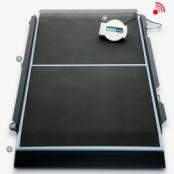 While it is designed for gurney or wheelchair weighing, you will find many other weighing uses for the scale. The robust construction is tough and durable and the scale is fitted with transport castors and an integrated handle making for easy movement from room to room. The digital display is connected to the scale with a cable making the display remote. The display may be mounted on the wall, desktop or the Seca 472 digital display stand. Remember, for over 160 years, the name Seca has stood for highest precision and functional design in medical weighing. seca products are exported to more than 100 countries and set market-driving standards. The company is a world market leader in medical weighing. Included in delivery is the cable remote display with easy to read LCD figures. It can be mounted on a table or hung on a wall at eye level. The display can be operated intuitively and is equipped with many intelligent functions: Thanks to the HOLD function, the patient can first be attended to before the result is noted. The innovative Memory-function of the seca 656 is particularly practical  for example in the casualty department before an operation: the total weight of the patient including stretcher or wheelchair is first determined. After again weighing the stretcher or wheelchair the net weight of the patient appears automatically. With the pre-TARE function, the additional weight of auxiliary aids can also be deducted from the total weight while actually weighing the patient. And, finally, the individual nutritional condition of the patient can be ascertained with the aid of the BMI function. Emergency admission to hospital  every-thing has to happen very quickly. Especially when an operation is necessary and the patients weight must be determined in order to ensure the correct dose of anaesthetic. The weighing of patients on stretchers or gurneys in this or in less dramatic situations is no problem with the seca 656: the platform is large enough for all common gurneys or stretchers on undercarriages. And, of course, patients can also be weighed comfortably on a chair or in a wheelchair with this platform scale. The seca 656 is thus suitable for use in the dialysis sector and in old peoples and nursing homes. Thanks to its extremely stable construction and very high capacity of 360 kg / 800 lbs, even heavyweight patients can be weighed easily with the platform scale 656. The platform is generously sized to cope with wheelchairs and all common roll-in systems and stretchers on undercarriages. The seca 656 is a very versatile scale as it is easy to move around on its smooth-running castors with the aid of the integrated handles. RS232 adapter kit for transmitting data to the serial interface of a PC or printer for seca 767, seca 763, seca 769 seca 644, seca 634, seca 664, seca 656, seca 674 and seca 674 C.
Stand for seca scale display units with cable-link remote control. Drive up ramp as accessory for seca 684, seca 656, seca 674 and seca 674 C.